My brother John who has been living in Crete, Greece had a car accident at the end of December 2018 and has since been in hospital in intensive care. 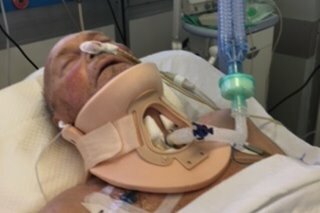 He has spinal injuries which have caused him to lose use of his arms and legs and he is unable to breath without the use of a mechanical ventilator. His condition is described as 'stable', but he is not receiving the specialised treatment he needs to aid his recovery because in Crete such facilities do not exist. The main factor that is delaying any treatment is that the Greek medical system is not free, and to get such treatment he would have to be transferred to mainland Greece, where his treatment and care would have to be paid for (estimated as €2000/week). I wish to raise funds for John to pay the costs of an air ambulance to repatriate him to the UK, where specialised treatment for his condition is available and where he will get the support and regular visits from his friends and family. In his present situation he is unable to talk and because he does not speak Greek he is able to understand only the few doctors and medical staff that can speak English. John needs to start getting the specialised treatment on an urgent basis as the longer he goes without such treatment, the less likely he will make a meaningful recovery.